The #1 Doctor recommended fiber brand. 100% natural psyllium fiber — in a convenient form. Power your health from the inside with Metamucil MultiHealth Fiber Capsules. Simply take one capsule at a time with 8 oz. of liquid. So it’s easy to get fiber in a convenient form. Helps lower cholesterol to promote heart health. Plus, if you’re on a low-carb diet, you’ll be happy to know Metamucil MultiHealth Fiber Capsules contain zero net carbs. The only leading fiber supplement brand with 100% natural psyllium fiber. This Metamucil product has a low glycemic index, a measure of the effect of dietary carbohydrates on blood sugar levels. GLUTEN FREE (may contain trace amounts less than 20 ppm). If you have specific dietary needs, you should consult your doctor before consuming this product. Swallow 1 capsule at a time and take in an upright position. Bulk-forming fibers like psyllium husk may affect how well medicines work. Take this product at least 2 hours before or after medicines. Start with 1 serving per day; gradually increase to desired daily intake. You may initially experience changes in bowel habits or minor bloating, as your body adjusts to increased fiber intake. Diets low in saturated fat and cholesterol that include 7 grams of soluble fiber per day from psyllium husk, as in Metamucil, may reduce the risk of heart disease by lowering cholesterol. One serving of Metamucil has 1.8 grams of this soluble fiber. Directions: 5 capsules 4 times daily. Consult a doctor if you are considering use of this product as part of a cholesterol-lowering program. Directions: 5 capsules 4 times daily. Consult your doctor before use if you are currently using medication to control your blood sugar levels. 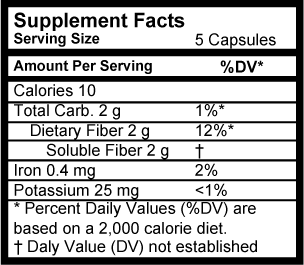 Directions: 2 to 5 capsules up to 4 times daily for fiber supplementation. For children under 12, consult a doctor. Notice: Take this product with at least 8 oz. (a full glass) of liquid. Taking without enough liquid may cause choking. Do not take if you have difficulty swallowing. Allergy alert: This product may cause allergic reaction in people sensitive to inhaled or ingested psyllium. Contact your doctor BEFORE USING this dietary supplement if you have recently experienced a sudden change in bowel habits persisting for 2 weeks, abdominal pain, nausea, or vomiting. STOP USING this dietary supplement and ask a doctor if constipation lasts more than 7 days or rectal bleeding occurs. These may be signs of a serious condition. To open bottle, push down and turn. Store at room temperature tightly closed to protect from humidity. See bottom for Best By date. - MultiHealth Fiber Capsules that promote digestive health. * - The #1 Doctor recommended fiber brand.